Songmics have done it again with this fabulous value for money children’s storage unit. If you are looking for something that doesn’t cost the earth, but looks stylish and holds lots of your child’s books and boxes for toy storage then check out this multipurpose colourful unit. The unit comes flat packed but I found it very simple to build on my own and did it fairly quickly. It’s quite light to carry empty and does have supports to attach to the wall should you feel you want to use them. The colourful toy storage boxes are sturdy and strong and ideal for my 6yr old’s endless little bitty toys that he loves to collect and he can remove a box when he wants and just put it back over the bars when he’s finished. The book holder is useful and I love the way all the books face you so that the child an select a book by glancing at the front cover easily. I try and change the books around every few weeks with others so that he constantly gets different ones to look at and choose for bedtime reading. Overall I’m thrilled with this storage idea and it has proved a hit with my boy, he loves seeing all his things and has easy access to them to play with or put back when it’s ‘tidy up’ time. With this being such a useful, great piece, I’m giving you the chance to win one for yourself – exactly as you see in the picture below. If you’d like to win then scroll down and fill in the gleam form to get your entries in. Songmics are an online household company that sells primarily through Amazon and has some great value, economical storage ideas. With everything from storage cubes to make up holders, shoe racks to laundry boxes there really is something to suit everyone at fantastic prices. We’ve been checking out a set of storage cubes which you can read about below and I also have the chance for you to win a set for yourself (choosing from the options below). These are flat pack kits that you build yourself, I did mine myself and found they didn’t take anywhere near as long as I expected although did require a little strength pushing the pieces together. I did have to get my husband to click a couple of the doors in when he got home as I couldn’t quite push them in fully. The cubes came together nicely and I was pleased with the results. These are mix and match so you can build them in any configuration you like, they could be in one long line, or built into a cube of nine like I did below. I chose a black scroll design which looks pretty and modern and is suitable for any room in the house. We’ve currently built this for my daughters room and she loves the easy to swing open doors and has filled each box with a different item of clothing, one cube for shorts, one for t-shirts, one for pj’s etc. These are lightweight storage cubes so I wouldn’t use them for heavy items such as books and they are very reasonably priced due to the light nature of the materials. They are therefore excellent value for money and make a great space to store things in like clothing. My daughter is really pleased with her new storage cubes, they look good, hold a lot of her belongings and she loves to line her teddy bears across the top! Looking for more storage in your house? Then an ottoman bed from Sueno is the way to go. With January being the start of everyone’s New Year decluttering, optimising your storage spaced at home is crucial to becoming more organised and keeping clutter at bay. With a move to a new house last year, I found my main bedroom almost half the size of my old one – eek! By the time I had fitted my wardrobes and chests of drawers in the room, I had no space for my beloved blanket box at the end of my bed so had to find a new home for it downstairs. This left an overspill of bedding, towels and blankets without a home but that’s where Sueno came to the rescue with this stunning silver velvet covered ottoman bed and matching headboard. Knowing we were on the lookout for a new mattress, I was also browsing beds and came across the relatively new idea of ottoman beds as opposed to just having drawers underneath which only give you a small storage area. Ottoman beds lift the whole upper lid of the divan up leaving you the entire inside of the divan for storage. This surely had to be the answer to my storage needs! I found Sueno online with a wonderful selection of high quality hand made beds that seemed to be perfect for my needs. They also came with a stunning array of upholstered headboards that can be matched to the fabric used to cover the divan part of the bed. I knew I wanted a silver/grey colour and thought I saw the perfect fabric on the website but to be sure I phoned up and ordered a batch of swatches. This was late on a Friday afternoon and after a lovely chat with customer service checking out all my concerns of the beds ease of opening, sizes etc I was impressed to find the sample materials arrived in my post on Saturday morning! Having selected ‘Silver Naples Velvet’ for my fabric choice, I was keen to place an order to allow enough time for the bed to be produced and delivered before Christmas. The website is user friendly and simple to use. I opted for a Sueno Ottoman Bed along with a Chesterfield Headboard. Delivery arrangements are by phone call allowing you to discuss a suitable date and although it’s an all day appointment they do give you an approximate idea of the time that they aim to arrive at your house. I also got a phone call within an hour before arrival from their in house delivery team. Being a long way from the production site my bed was the last delivery of the day and at approximately 6pm the lorry turned up. This is where purchasing from an established independent family run company really shines through. Not only is the bed delivered to your house, but the delivery team carry the bed to the room of your choice, remove and take away all the packaging and then build the bed in front of you, leaving you with a fully set up ottoman bed ready for you to apply fresh bed linen onto. That extra bit of service is really worth it and makes the whole experience a lot more pleasurable. We probably wouldn’t have built the bed that evening if it’d been left in the hallway covered in packaging whereas we had the novelty of sleeping on our new bed that night. The team even kindly unpackaged and placed our new mattress upon the divan which we had purchased from Wayfair a few weeks prior, and I’m so grateful for that as it is incredibly heavy! So what can I say about my new ottoman bed? The bed is amazing, everything I expected and more. It looks stunning, feels stunning and the bit you’ve all been waiting to see is the storage which is fantastic and incredibly spacious. The structure of the bed is well made and the quality is high. The base lifts up using two fabric loops on the side with the help of the sturdy gas struts to ease the weight. When the gas struts are fully opened they hold the weight of the top of the bed and mattress in place allowing you to reach in and organise your belongings inside with both hands. I’m so pleased with this storage space and managed to fill the ottoman bed in no time at all. It does need organising though which I’ll do in my Spring declutter and I need to also invest in some vacuum storage bags to shrink down a spare duvet I keep in there. The whole thing looks amazing and you’d never know that it held the vast amount of storage inside that it does. The whole look of the bed and headboard is stylish and modern which has given my bedroom a higher quality feel and image. We still have a few finishing touches to go such as curtains and carpet but hopefully these will be achieved this year for a whole bedroom makeover – a complete turn around look from the fitted wardrobes and flowery wallpaper that adorned the walls when we moved in. All in all I’ve achieved my goal of more storage in a stylish way thanks to Sueno. I can’t fault the quality or customer service, both of which have been outstanding and a company I’d highly recommend and would use again (should I ever need a new bed!). Why not check out Sueno for ottoman beds to give you the ultimate bedroom storage solution that keeps all your belongings hidden away but easily accessible? All reviews are my own and my family’s opinions and we received a discounted product in order to write an honest review. Having moved to a new house earlier this year with a garage, who’d of thought we could practically fill it with belongings that lived inside our house mainly in under stair cupboards previously. We came from a large Edwardian terrace with only a courtyard garden so never had a shed or garage so the luxury of having a garage now has been bliss. Only how are we to store everything easily so that it’s accessible and easy to find. The answer has been with a fabulous range of Storalex Shelving bays from Tufferman. I left the husband to build the shelves whilst I was at work and apparently they are simple to assemble, didn’t take to long and something he was quite able to do on his own. The shelves are of a great quality, they look good and seem very strong and durable, just what we need. What we really like is the versatility with them, you can choose the height of each shelf so can have them equally spread or some smaller and some wider apart. Also rather than just having a tall shelving unit, you can split the shelves into two seperate pieces to create a workbench scenario. My husband wanted the workbench so we created an L-shaped area in the centre of the other two shelves to use to work on. We’ve also attached some boards to the wall which we’ll attach tools onto. We’ve managed to make a huge difference to our garage storage which was just piles of boxes across the floor. It’s become an organised place with easy access to what you need. The shelving looks great and matches which helps the space look tidier. With durable, hard wearing shelving like Storalex from Tuffermans you can’t go wrong. It’s definitely worth checking out if you are looking for garage storage solutions. One thing I’m short of in my home is storage, particularly since having children, so when I had the chance to try out some Packmate vacuum storage bags, how could I refuse? I’ve never tried vacuum storage before and wondered how effective it would be. I was sent a selection from the range available including jumbo, large and travel bags. The first thing I noticed was the black leaf design on the Packmate bags which I found really appealing, they would look attractive even if they are stored under the bed or in the wardrobe. The reverse side of each bag with the valve is clear so you can see what’s inside. Living so far from my family I have a couple of spare duvets, various blankets and things that are only used occasionally and if I could condense them, I’d have more storage for other things. So the next step was to try them out. They were easy to fill with their wide opening on one side which is easily closed by a plastic zip that slides across. There is a simple valve on the clear side of the bag which lifts to open, then you apply the hose of the vacuum cleaner to expel the air from the bag before pushing the valve down to close it. One item that took up a lot of room was our guest double duvet which is stored in a zipped bag under my daughter’s bed. I took this out, rolled it up and but it in a large Packmate high volume storage bag. I then expelled the air and result can be seen below, it takes up a fraction of the space it did before leaving me additional room to add extra items such as a couple of pillows to the bag. I am impressed at how well the Packmate vacuum bags have performed, leaving me with lots of extra room in the house, these are the ideal space savers, great if you only have a small space or have a lot of things. 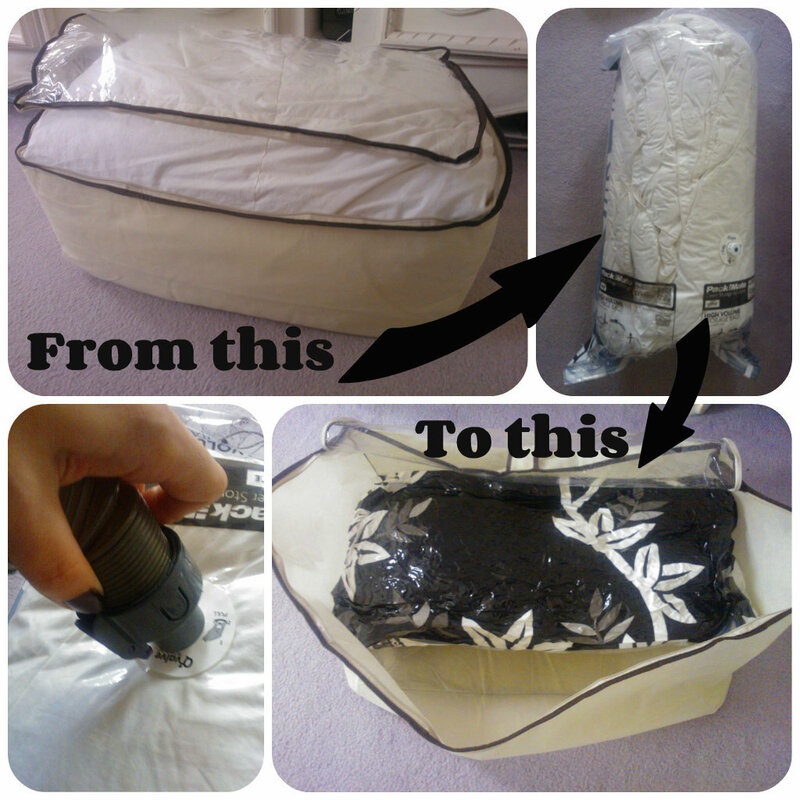 Vacuum bags are great for items that you don’t use regularly particularly large bedding items or cushions. Another advantage of using these bags for storage is that they protect against moisture, mildew, bugs and dirt. They are made from a tough tear resistant material that will withstand use again and again. 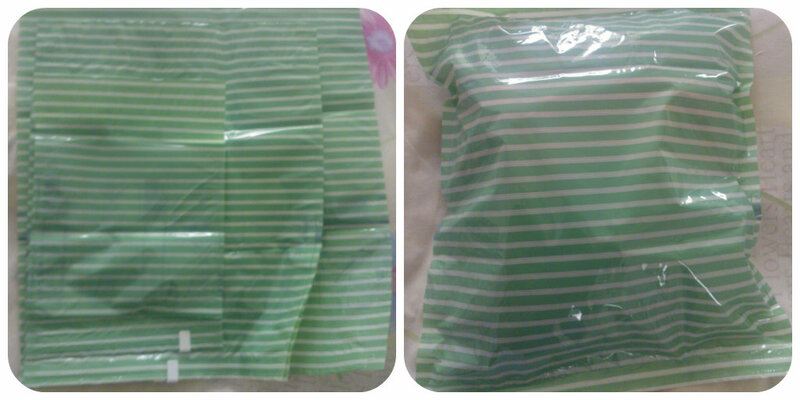 Within the Packmate range of vacuum bags is a set of travel bags. These are a lot smaller and come in various sizes with the zip top feature but without the valve on the back of the bag. The beauty of these bags are that you can either roll them up, press them or if you have a vacuum cleaner handy you can poke the nozzle in a partial opening of the zip to compress the bag. How fantastic is that for travelling with limited space? I know this is something I come across each year when we go on our family holiday. A car full to the brim of four people’s belongings. Being able to compress some of that will definitely be a bonus and make more room in the car. 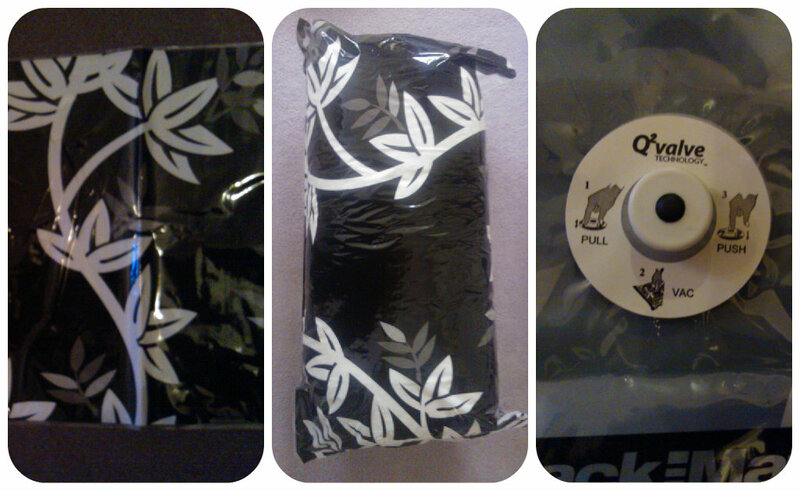 If you are away from home you can simply roll the bag up to expel the air, it couldn’t be any easier. All Packmate vacuum bags come with a 5 year guarantee and are available from Home Storage Direct with free delivery on all orders. I think these are a fantastic way to organise your belongings, they’ve certainly helped my family make a bit more room and will get plenty of use from them over the next few years.